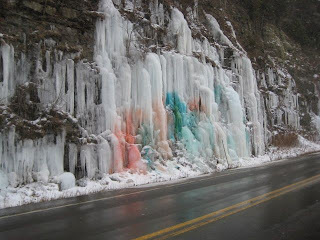 It looks like some folks got creative with tempra paint on the Kilawog Rt 11 ice flows. It gets pretty. I can't wait until we can blast some paint bombs up higher with a potato canon appropriately loaded. Err... I mean until someone comes along with a potato canon with dry paint bombs. Life is too short not to make art where you can.